The latest entry in a Dutch series about a toddler named Kevin follows the little one as he gets ready for Christmas with his family. 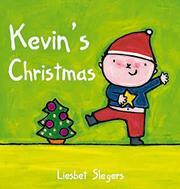 Kevin, who appears to be about 2 years old, narrates his family’s Advent preparations. He decorates a tiny tree and places a Nativity set under it, with an explanation of the religious significance of the holiday. Kevin continues with his holiday activities by mailing his holiday greeting cards and creating a bead necklace as a gift for his cousin. He helps his parents with shopping and preparing a “great big Christmas feast” with extended family. The book’s heavy, coated pages with rounded edges and Kevin’s young age imply a toddler age range for the audience, but text is too long for most children in this age group. The toddler does not speak with the voice of a child, but as an adult in many of the descriptions, with a resulting preachy tone. The bold illustrations, however, are just right for babies and toddlers, with round-faced, chubby children and simple shapes with heavy outlines.